Scientists have secured £5 million of funding for research into nanotechnology that could result in faster computers, smarter sensors and more energy-efficient mobile phones. Led by the University of Southampton and funded by the Engineering and Physical Sciences Research Council (EPSRC), the research team aims to develop the technique of supercritical fluid electrodeposition to make and enhance materials at the smallest scale possible. High-tech materials underpin a wide range of photonic and electronic devices, including recording and medical equipment. Silicon, for example, is used as a semiconductor in computer chips. How materials are layered and patterned helps determine the qualities of devices such as storage, speed and power. "The drive is always to make technological devices faster, smaller and smarter," says project leader Professor Phil Bartlett, from the University of Southampton. "Our aim is to develop techniques that could be used to produce significantly smaller and more complex nanomaterials for data storage, sensors, energy conversion and a huge range of other applications that no-one has even dreamt of yet." Electrodeposition, also known as electroplating, is already widely used to layer or add properties to materials to protect or thicken them or for aesthetics. The process deposits liquid into the pores of the material - but it has limits. "Electrodeposition of materials into pores with diameters smaller than a few tens of atoms is very difficult, if not impossible, from liquids," says Phil. "But using supercritical fluids - halfway between a fluid and a gas -means we could potentially reach pores of less than two nanometers. Supercritical fluids can completely fill a space, like gas, but have properties of a liquid that can be altered by temperature or pressure. Their extreme penetrating powers will enable electrodeposition to apply to structures far smaller than anything achieved to date." 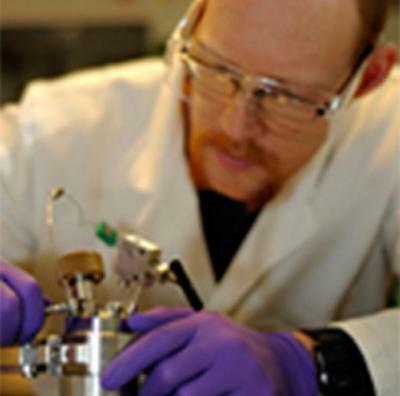 The five-year programme brings together researchers from the universities of Southampton, Nottingham and Warwick with expertise in electrochemistry, supercritical fluid science, synthetic chemistry and materials physics. "This is a distinctive team with complementary and unique skills and expertise," says Southampton physicist Dr David Smith. "The programme gives us the opportunity to investigate new materials, perhaps to use as clever coatings that respond to their environment or that reduce friction, and to bring together materials that do not naturally co-exist."